Luminous ECO WATT 650/665/700 Home UPS is a square wave home UPS designed with a simple user interface, making it simpler to maintain batteries and inverters without any worry. 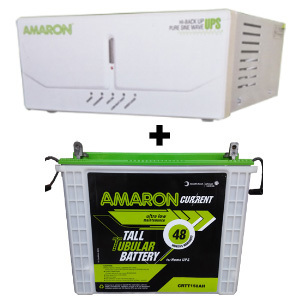 A highly efficient home UPS model, it fulfills power backup requirements with customer centric innovation, giving battery life a 70% enhancement. Powerful thermal management system to auto-cool or shut down system depending on temperature. Inbuilt water-level sensor indicating battery water requirements. Promotes longer battery life with automated holiday mode and no-load shutdown. 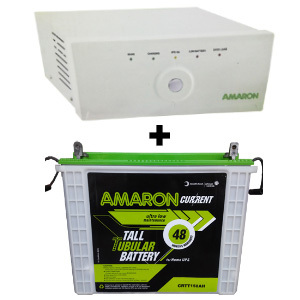 Charges battery quickly with 3 selectable current settings and even at low current availability of 110 V Mains AC. 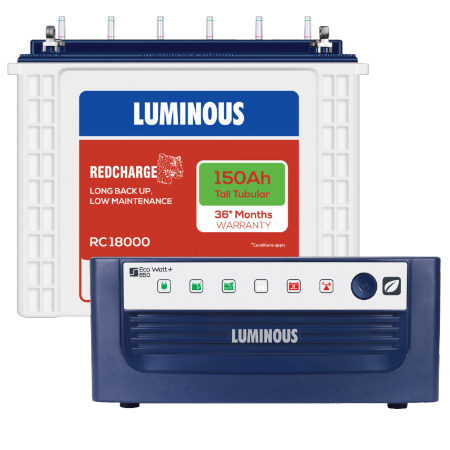 Saves battery consumption and life with advanced battery maintenance systems. Offers four layers of protection: Overload with Auto Reset, Battery Reverse Polarity Protection, Ultra-Fast Short Circuit Protection and Batter Deep Discharge Protection with Reset Option. Uses FSW technology for long-term life and efficiency. There are visual indicators for Charging, Eco Overload, Battery Electrolyte Level, Low Battery Level and ON Mains. There are audio alarms for Battery Over Voltage, Short Circuit Trip, No Load Shutdown, Battery Low Pre-Alarm, Battery Low Trip, Overload and UPS ON. Overload, battery-deep discharge, ultra-fast short circuit and battery reverse polarity protection. 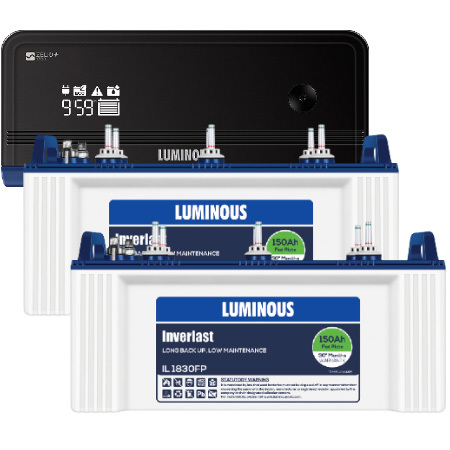 Luminous Tall Tubular Batteries have unique patented alloy composition, which protects the lead part of battery from corrosion. It has void free, uniform grain structure, which ensures consistent high quality performance. These batteries not only charge faster, they last much longer as well. This reduces electricity consumption, which in turn increases financial savings. What's more, their unique design makes them extremely strong, so they withstand longer power cuts.